Nutritional health coach to the stars, and bestselling author of Get The Glow, Madeleine Shaw knows that life is a balancing act. Monday to Friday it's hard to juggle the demands of work and family with eating healthily, and the weekends are full of temptations that undermine our best efforts to get our glow. 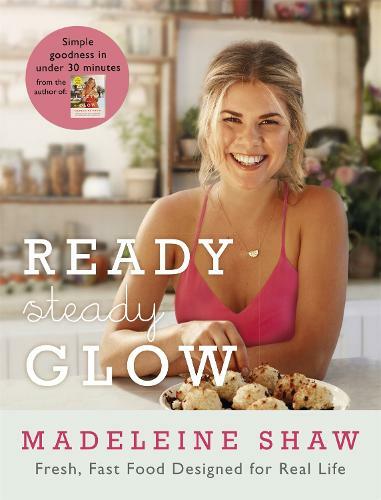 Madeleine offers the answer in Ready, Steady, Glow, a beautiful and accessible cookbook designed for real life. Ready, Steady, Glow is a book of two halves offering weekday recipes that can be made in less than 30 minutes, alongside sumptuous show-stopping meals perfect for the weekend. All recipes are wheat- and sugar-free, bursting with flavour and nutritional value, and contain natural ingredients that can be found in your local supermarket. You'll be amazed by deceptively speedy breakfasts such as coconut and lime quinoa porridge with honey almond crumble; lunches on-the-go like courgette and halloumi frittatas with lemon poppy yoghurt; and fuss-free, fridge-fix dinners such as Goan chicken curry. At the weekend, you can unwind and de-stress as Madeleine provides sumptuous brunches perfect for lazy days, along with impressive mains and desserts, designed to be shared. You'll be feasting - not fasting - on food that tastes so good you'll forget the things you're cutting out. With Madeleine's expert yoga routine, trademark meal plans, inventive tricks for speedy preparation and specialist down-to-earth advice, Ready, Steady, Glow is all you need to eat well and be well, for life. 'After the success of her first cookbook Get the Glow, nutritional health coach Madeleine Shaw returns with a fresh selection of recipes that are quicker and easier to make than her previous ones, while retaining all the health benefits. All of the recipes in this book are free from gluten and refined sugar, and all but a few are dairy-free too. Just because you're avoiding dairy products doesn't automatically make you a vegan, and delicious recipes like Chinese duck bowls and lamb cutlets with salsa verde are bound to satisfy even the carnivores, setting this book apart from a lot of other "healthy" cookbooks.